Moss can be a tremendous addition to the damp and shady garden. Whether it is used as a natural ground cover, a complement to rock landscaping, or to cover a wall, the green shades of these plants add a sense of tranquility to the home. Mosses, unlike most garden plants, lack true roots. Without an extensive root system, most mosses rely on damp conditions to ensure they thrive. However, this also means they are built to pull all the nutrients they need from the sunlight, air, and surface soil. They do not require deep watering or heavy fertilization. Once established, they are easy to care for. There are two primary ways to plant moss in your garden. The first involves planting them sheets or clumps. Lightly rake or scratch the surface of your garden and water it well. Consider adding something to retain moisture, such as water gel crystals. Lay your mosses on top of the soil and water or mist lightly. This misting may need to be repeated daily for several weeks, but once the mosses are established, they will tolerate drier conditions. To cover rocks or walls, consider this unconventional method. Handfuls of moss can be blended with buttermilk or yogurt, plus water, sugar, and other additives. The resulting liquid can be painted or sprayed onto the target surface. Mist lightly daily, and soon your mosses will begin to flourish. This method allows you some extra creativity. You can paint or write different shapes almost anywhere. Mosses are attractive and easy to care for. They impart a soft and inviting look wherever they grow. Consider adding them to your garden, patio, and indoor containers. Arthritis is an extremely common and often debilitating disease, especially in older adults. Joint pain and discomfort may become worse at times, which can keep you from doing and enjoying activities you once loved. The natural reaction is to stop moving and rest, but science shows that engaging in regular activity is actually helpful in managing the disease and combating flare-ups. One of the best activities for arthritis sufferers is gardening. Gardening is a wonderful way to get outside and enjoy nature. Whether a veteran or a beginner, gardening has been proven to prevent joint stiffness, improve range of motion, and stay flexible no matter how much or how little you do. However, doing too much for too long can aggravate symptoms. Thankfully, there are many ways to continue enjoying gardening without causing a flare-up. Stretch. Take a few moments before and after gardening to gently stretch your back, legs, and shoulders. Regular stretching helps to prevent injury and reduce muscle soreness. Work at the Waist. Raise your gardening bed, or use shelves or tables, so you don’t have to bend over or stoop down unnecessarily. Working at waist level will place less strain on your lower back and hips so you feel more comfortable. Choose Bigger and Longer Tools. Tools with longer handles will keep you from having to bend over so often while tools with bigger grips will make your hands more comfortable for longer periods of time. Get in the habit of keeping them nearby so you can take fewer steps to get the job done. Choose Electric Tools. If using hand tools causes flare-ups, consider switching to electric tools that will do the work for you. Use Knee Pads or Benches. Knee pads add cushion so your knees won’t be so strained. If kneeling down is still difficult, consider using a small bench or stool to sit on to take the pressure off your knees and back. Use the Right Gloves. Wearing gloves while you garden not only protect your hands from cold temperatures, they also help you to grip and twist objects more easily so you have less stress on your joints. Consider buying cushioned gloves that are specially made for arthritis sufferers to ease joint pain. Or, for a cheaper alternative, buy regular gloves that are a little bigger than you would normally wear and stuff foam padding inside while you use them. Use Carts. Instead of carrying everything in your arms or in buckets, use a cart with pneumatic tires. The wheels will make it easier to transport your supplies and plants regardless of the terrain and reduce strain on your shoulders and back. Avoid High Maintenance Plants. Plants that require a lot of upkeep may be fun to tend, but they can take a toll on your joints. Consider perennials or those that are drought-tolerant so you can spend less time maintaining your beds and more time enjoying their beauty. Consider Container Gardening. If getting outside is getting too difficult, bring your plants to you with container gardening. Maintaining your garden on your patio or porch takes less energy and less stress on your joints. If this isn’t an option that interests you, consider setting up a greenhouse. Greenhouses allow you garden in a consistent temperature, and you can place your plants on tables or shelves so you spend less time on your knees or bent over. Change It Up. Change your body position often or take the time to stretch and rest as you garden to reduce stiffness and the potential for joint pain. Also, be sure to change your routine from time to time by breaking up the things that need to be done into smaller jobs that you can do throughout the day or over several days. Try Community Gardening. If keeping a garden at home has become too difficult, join a community garden near your home. Community gardens usually provide the tools and resources you need to make gardening easier. They are also a great way to meet other gardening enthusiasts and make friends who are happy to help you. Community gardens provide a place to be social while you indulge in digging in the dirt. Know Your Limits. Always respect your body and know your limits. Though gardening is a peaceful activity, it is still necessary to pace yourself. Don’t push yourself too hard if you’re feeling tired. Take frequent breaks so you can give your joints a rest. Talk to Your Doctor. Most importantly, always check with your doctor first to be sure it is safe to engage in gardening. Your doctor can make recommendations for managing your arthritis and reducing the chances of a flare-up. Gardening is a wonderful way to get outside and enjoy the work of your hands while combating arthritic flare-ups. By making a few simple changes and being vigilant of your effort levels, you can enjoy gardening for many years to come without your arthritis getting in the way. Silky Dogwood Live Stakes are large bushes or small trees that are notorious for their creamy white flowers. The tree can reach a mature height of about 6 to 10 feet, its mature width also reaching 6 to 10 feet in total. This type of Dogwood can grow in zones 2 to 10. It prefers full sunlight and a soil type that is both fertile and moist. However, Silky Dogwood Live Stakes are fairly adaptable and can tolerate a moderate amount of shade. Similarly, they have been found to grow in open fields that are drier and less nutrient rich than the trees generally prefer. The seeds that are produced by the Silky Dogwood Live Stakes attract numerous animals. The trees are capable of growing large colonies and are often used to stop erosion. When growing near water, the root systems help keep the soil intact. The limbs that touch the soil are also responsible for regenerating new plants, therefore creating the colonies that are known to develop and combat erosion with extensive root systems. This kind of Dogwood is popular in landscaping for its blooms and appearance. The trunk itself has a greyish-brown bark with multiple trees growing from the most central trunk. The leaves have a green color in the warmer months, then change to a dark red as the weather cools. In the spring, the trees bloom with small, white to creamy flowers. These flowers grow in large, attractive clusters and are pollinated by a number of bees and other insects. Birds enjoy the small, black seeds that follow the flowers. Not only are these trees attractive for their blooms and for their ability to prevent erosion along banks, but they’re also useful for creating screens along property lines. Silky Dogwood Live Stakes are undoubtedly a beautiful touch to any garden landscape. The sassafras tree is highly prized for its aromatic leaves and roots, which were once used to make old-fashioned sassafras tea, that are ground to make the file for Cajun-style file gumbo. Found throughout most of Eastern the United States, the sassafras tree grows well in Hardiness Zones 4 though 9. Sassafras can be planted in dense thickets to produce brilliant foliage displays in fall, or it can be planted alone as a shade or ornamental tree. When used in landscaping, seedlings and very young trees are preferred for transplanting, as older trees are generally difficult to transplant successfully. The tree’s seeds are also suitable for germination. Seeds are collected in the autumn and planted the following spring. Sassafras is a medium-fast grower, with most trees adding anywhere from 13 to 24 inches to their height each year. At maturity, sassafras reaches anywhere from 30 to 60 feet high and has a canopy that reaches 25 to 40 feet wide. Sassafras thrives in areas with at least four hours of direct sunlight each day, but also tolerates partial shade. This tree prefers soil with a low pH, but can adapt to a wide variety of soil types, including wet, acidic and loamy soils. Sassafras trees are tallest when they are grown in well-drained, loamy soil or well-drained sandy soil. Sassafras is moderately drought tolerant and can withstand some exposure to salt. Often called the Acer rubrum, the Red Maple is one of the most beautiful trees to have in a yard. They have a deep color pattern that makes them stand out among others. They are gorgeous with a beautiful scarlet color in the fall that makes them a great choice. They are easy to grow and can work in climates from the deep south to the north. Installing a maple tap for fresh sap is also possible with this variety, but they will not produce as much as other maple varieties. These trees can grow to reach heights of nearly 50 ft., which is important to consider when planting them. The Red Maples are one of the most common and gorgeous trees to add to any landscape. When speaking of maple trees, most people commonly think of the sugar maple. This tree variety is by far the most common and beloved of all the maple trees. Those who want to create their own homemade syrup from the sap will find an abundance with this variety. With the ability to reach 100 ft., these trees can provide ample shade to any outdoor space. Because they can stand temperatures from 0 to 100° F, they are hardy and able to be planted in most locations throughout the United States. They the state tree of Road Island and with good reason. They are an excellent addition to add to any piece of land for shade, sap and exceptional beauty. For those who want shade and lots of it, the Pink Oak Tree is the perfect selection. This tree is not for a small yard, it is gigantic and there needs to be a space of around 600 sq. ft. to plant and allow ample room to grow. They need plenty of water and an acidic soil for them to reach their full potential. With stunning yellow leaves and the abundant amounts of shade, these trees are voted most popular due to their benefits and beauty. For a splash of color and a truly superior look in landscape, add a beautiful pink dogwood tree to the yard. These trees need some shade as the full sun is too much for them to handle. They need an acidic soil and prefer a dryer climate. They do not grow as large as most trees, roughly around 25 feet, but they can certainly give a whole new look to any yard. This flowering tree is one of the most desirable species because of its beautiful pink color and unique biscuit shaped flowers. Perennials will die back each autumn and remain dormant through the winter months. They will return from their root-stock each spring to provide an excellent foundation to any garden. Perennials are considered the backbone of any good landscaping project. The annuals must be replaced each year as in the case of lobelia, but the perennials reappear each year without any additional work or expense. They provide texture, form, and a variety of colors that can be counted on year after year. Bloom time, lifespan, and culture will vary among perennial plants. Short-lived perennials last only three to four years. This category includes delphinium and lupines. Other varieties can last as long as 15 years, while peonies will continue on for a lifetime. There is no set rule for all perennials. Some require shade while others need full sun. You’ll also find ones such as the gooseneck loosestrife that will over run the garden. Perennials are beautiful on their own, but they can be accented with annuals. Lobelia has a dainty flower that is perfect as a garden border around perennials. Many people think of garden varieties when they hear someone mention perennials. This would include the daylily. It is a favorite of gardeners for their continuous blooms. Each daylily has many buds that continually open up into beautiful flowers. The flowers only last for one day, but with so many buds, you’ll have non-stop blooms all season. Daylily is often called the perfect perennial because it comes in numerous sizes, shapes, and colors. It’s drought tolerant and suitable for many forms of landscaping. Some perennials are found scattered in the wild such as the May Apple. They are found throughout Eastern North America in pastures, woods, and thickets. The May Apple is actually an herb, but the roots are toxic so it should only be used by those with experience. The small white flowers that appear each April and May eventually turn into edible fruit. plant food, weed control, and don’t forget the TLC! your garden dirt. Mix well with a rake or fork. then plant them accordingly.Try our garden store for low prices. get them through harsh temperatures. soil where plants have been growing repeatedly. young plants of water and nutrients which they need to grow tall and sturdy. budding seeds or plants grow into the lush garden of your dreams! your yard or indoor spot. definitely want perennials. Here are some of the favorites and most colorful. life, usually only a few years. as long as it is kept moist. grows well in moist soils. delightful sight in any garden. a must in your perennial garden. sale, you have found them at a plant nursery. incandescent, wing-like blooms in your garden with sufficient sun and water. bold red flowers and hardy green stalks are breathtaking. kaleidoscopic fashion, changing each night over a period of several weeks. spring, and grows up to 14 inches tall and up to a foot wide. colloquially as Stinking Benjamin, due to its not so pleasant odor at close range. providing attractive color for garden areas throughout summer. will do better in partial shade. or full-shade and resist most diseases and insects. rainfall. Sometimes called Virginia cowslips, they bloom in early spring. As a home gardener, you will always want to beautify your garden and front yard with trees. There are a variety from which you can choose depending on your particular hardiness region. For best results, you will want to plant native trees that will flourish for years to come. Flowering trees are a particular favorite as they grace you with sheer beauty, while shade trees can offer a good deal of shade to other plants that require it. Here are a few of the best trees you may want to consider. The red oak is one of the most beautiful shade trees. It is also commonly referred to as the Northern red oak or Champion oak and is appropriate for planting in hardiness zones 3 through 8. It has a nice, long life span that can last as much as 500 years. Foliage is typically green, the tree is adaptable to generally all soil types and moisture conditions and it can grow to heights of 65 to 90 feet with spreads of 60 to 70. It has a moderate growth rate and changes to a lovely red color in the fall. Plant the red oak in a spot where it has access to full sunlight throughout the day. The royal empress is one of the most exquisite and popular flowering trees you can plant in hardiness zones 5 through 11. While it is native to China, it thrives throughout the United States and even doubles as one of the best shade trees. It is a very fast grower and can reach heights of between 40 to 50 feet with spreads ranging from 30 to 40 feet. A nice perk of this tree is that is is resistant to drought. Choose a spot for planting that receives full sun to partial shade for best results. You will be graced by a lovely fragrance that ranges between jasmine and gardenia when the beautiful lavender colored flowers begin to bloom. One of the best native trees is the autumn brilliance serviceberry. It is highly coveted for the incredible beauty of its deep red fall foliage and delicious succulent purple berries that can be eaten raw or used to make pie or jam. During the growing season, the leaves are a lovely blue green. The tree can grow to a mature spread of 15 feet and to heights of 20 to 25. It fares best when planted in hardiness regions 3 through 8, needs full sunlight and is adaptable to any soil type. In the early spring, you will notice lovely white flowers blooming. The American sycamore is one of the best choices of native trees to plant. It thrives best in zones 4 through 9 and can grow up to 70 to 100 feet and widths of 60 to 80 feet. Soil should be kept moist and the tree requires full sunlight to grow to its best potential. Soil should be well draining. One of the easiest ways to distinguish the sycamore is its bark, which peels off and gives off a mottled appearance throughout the year. Another busy weekend approaches with my two children, so I mentally prepare for the activities–my daughter’s volleyball practice, my son’s Science Club meeting, a trip to the grocery store–and that’s just Saturday. What I need to do is gardening. Not only is my yard overdue for fresh flowers, but my soul needs gardening meditation. When did I last shop for garden plants? As parents today, we somehow over-plan our free time and over-accept social invitations. What happened to the times when we were young? We would look forlornly at our mom and dad and, with complete sincerity, utter the words, “There’s nothing to do.” Maybe our gaming systems have stolen our ability to daydream. Maybe our smart phones make it too easy to text “yes” to every birthday party invitation. Maybe we have forgotten how to give our children some quiet time. I pondered this as we drove around town. Sunday morning came and I looked upon my neglected yard from the kitchen. It then dawned on me. What did I crave most for my children and myself? We needed an old-fashioned, stay-at-home-with-nothing-to-do day. This lasted only a short time as sibling bickering began half way through pancakes. Instead, I told them to throw on old clothes and meet me outside to get dirty. They complained at first with images of hard labor, but once I pulled out the small shovel and plastic rake, plus some trimming shears for me, it was pretty simple. Although they were “working” in the garden, they were also playing with snails, digging their hands into the dirt, pouring water on each other, and laughing, not to mention working up a sweat. Next, we headed out to buy a few garden plants, colorful flowers and some cool-weather vegetables. It would be enriching for them to watch something grow from a tiny plant to a mature vegetable. They would eat that meal knowing they made it happen with their own two hands. That potato would be best potato they had ever tasted. We scurried home to plant our garden, using compost to nourish our new plants. The purple daisies immediately brightened the yard, but the tiny vegetable plants were disappointing to my children. In these times of instant gratification, waiting for vegetables to grow is, well, disappointing. Nevertheless, this was a learning experience for them and a cherished moment for me as I shared my love of gardening and the outdoors. We are still waiting for a bumper crop, but anticipation is good for the soul. Flowering shrubs can make an attractive addition to any landscape. When creating the perfect design for a yard, it is important to add color and a unique element to the flowery mix. Oftentimes, these plants are fragrant and used as a foundation plant for a stunning addition. It is not uncommon that they are used as hedging or to create a private feeling in a yard. There are many varieties that are popular, but here are some of the best flowering bushes to use. There are hundreds of varieties of these shrubs available. They come in many beautiful color variations from pink, purple, white and even blue. They are commonly recognized for their large, fragrant pom-pom blossoms. 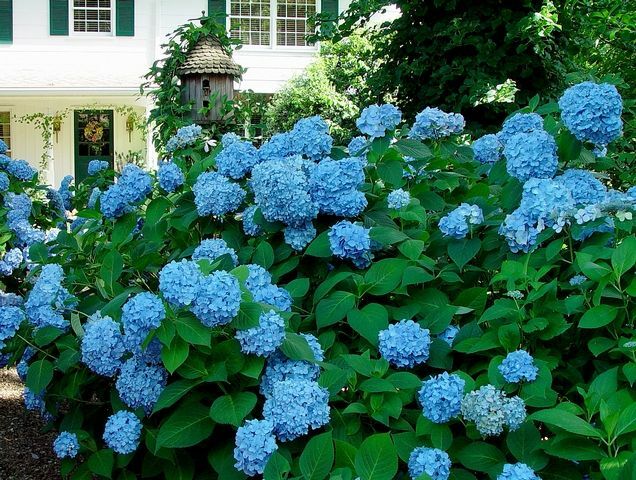 The hydrangeas bloom from the early spring until late fall. They can grow rather large and are known to be able to climb a tree. First discovered in Southeastern Asia, these plants have been used for centuries to smoke, create teas or use as an ornamental plant. Their large and domineering appearance makes them the perfect additions to any landscaping. Named after the famous Biblical event in the book of Exodus, the burning bush is a stunning flowering scrub. These bushes flower in the autumn and add an attractive splash of color to the fall decor. As a giant bush, these can grow over 15 feet tall. The vibrant colors are various shades of red and can even have a touch of pink in them. This bush will also have berries that grow in the fall season. This pants were brought to the US from Asia. They prefer a rather dry soil, as opposed to wet conditions making them a Zone 4 plant. Many people are shocked to learn that forsythias are actually a member of the olive family. Native to Eastern Asia, these bushes come in 11 different species. They are characteristically known for their grey-brown bark and their vibrant yellow flowers. Of all the flowering shrubs, this one is one of the most common to see around landscapes.This bush reaches its peak in the springtime and leaves a beautiful addition to any flower garden. They are hardy and can withstand different zones. It has been widely used by Chinese herbology, as one of the major 50 herbs. The branches of this bush are also used to create strings for the ajaeng instrument in Korea. 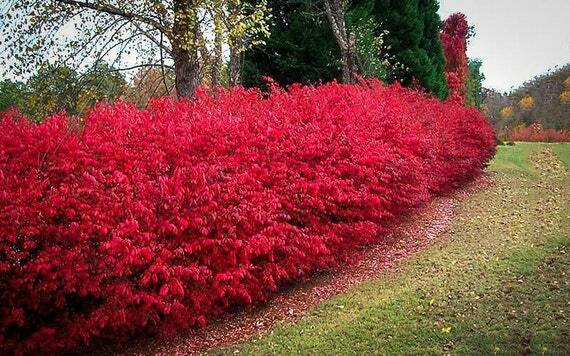 These bushes are widely used in parks, gardens or along roadways because of their stunning beauty and versatility. Flowering bushes can create a colorful array to any landscape design. These three varieties are hardy and boom over several weeks given any space a great hue of color. These bushes can withstand pests that would destroy other plants. They have vigorous growth and because of their root systems, they are a strong and sturdy option. When selecting the perfect shrubs for a landscape designs, these bushes can be paired with other plants and shrubs or be used alone. With fragrant smells and a burst of fabulous colors, these plants make the perfect addition to any area. It is a lot easier to sit at your computer and shop online, than to waste time and gas going shopping to all your local nurseries looking for plants. There are many to choose from, simply type in something general, in the search engine, such as, ‘where to buy plants online’, and it will give you a ton of options for your area. This is absolutely a genius idea, especially if you live where its really hot, or really cold. You never have to leave the comfort of your home. You sit and click, and they will let you know what is available now, you pay and then they deliver your plants, its that simple. If something is out of season or out of stock, the garden center online will let you know, and you can still place the order, but will only receive your plants when it is the right time. This is also a great option if you work a lot, you can order right from your desk, while working on your latest report, due in an hour, and you boss will never even know. A garden center online is an ideal choice for folks that may be elderly or handicap, and can’t get around well. You can order from your bed if you choose. These places are also a very good opportunity to get great bargains on things that are going out of season, such as annuals, or seasonal plants, such as Poinsettias, or maybe Chrysanthemums. After their flowering season is over, the growers simply just want to get rid of their old stuff so they can bring in the new ones. So, if you keep your eyes peeled, you might find some really good deals, that they consider basically, ‘throw away stuff’, you can buy cheap and give some TLC – tender loving care, and nurse it back to health, and you have a beautiful inexpensive plant, that you never had to leave home to receive. Something else you might get really cheap are vegetable plants, that are tall and straggly, or the planting season has ended, but someone with a green thumb is bold enough to grow out of season, perhaps in a greenhouse on indoors, will jump at this opportunity. To buy from a wholesale nursery is the best way to go, if they sell to the public, along with distributors. You get retail product at wholesale price, what can be better than that? Oh yes, not having to leave home to do it. You can still afford to have your plant and vegetables by using the garden center online, and saving money. If you pay attention, you might get a great deal by buying something at the end of its normal growing season, or perhaps buying in bulk can save you a lot of money also. So check out buying plants online, and you will be pleasantly surprised at the money you can save. Happy shopping! Nothing makes a landscape look neglected like soil erosion. Soil erosion is a result of lack of sufficient moisture and plant growth. Plant roots provide protection against soil erosion. This is why gardeners choose vines for areas where soil is eroded. Some of the strongest vines are English Ivy, Pachysandra and Partridgeberry. These create an attractive landscape and do a great job of developing strong, deep roots that hold soil firmly in place. When planting vines, look for places most likely to suffer from soil erosion. This may be near downspouts or sloping downhill inclines. English Ivy and pachysandra do quite well near downspouts. Their roots absorb water and keep the soil in place. English Ivy looks quite stunning with its glossy, dark green leaves. The leaves of Pachysandra are usually light green or they may be variegated. This plant doesn’t mind shade. English Ivy needs a balance of sunlight and shade to flourish. Plant English Ivy and Pachysandra around the bare areas beneath trees that get a few hours of daily sunlight. 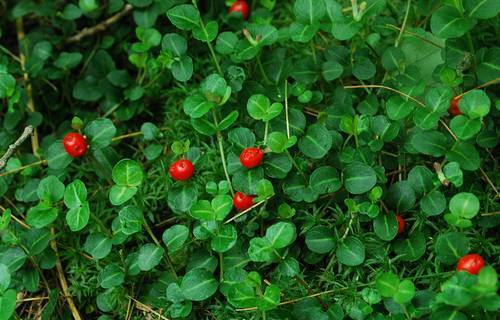 In Sweden, partridgeberry is known as lingonberry. Newfoundland and Labrador residents also treasure the partridge berries that grow during their limited summers. Partridgeberry duff is one of the best known “Newfie” desserts. As a vine to prevent erosion, the partridgeberry plant is low growing with sturdy green leaves and fuzzy white flowers that turn into scarlet berries. Partridgeberries have become quite popular to prevent soil erosion and are useful for recipes. Teas are made from partridgeberry leaves. The leaves and berries are high in Vitamin C, antioxidants and tannin. These plants grow across much of North America in thick mats near swamps and bogs, as well as rocky slopes. English Ivy, Pachysandra and Partridgeberry vines solve the problem of soil erosion with many extra benefits.